Maybe I’m sentimental but there’s something special about reading a book that has travelled half the world to get to you. My copy of this omnibus edition of Narayan’s work was sent from India by Vishy from Vishy’s Blog and I’m really grateful he made me discover this writer. My copy includes four works by Narayan (1906-2001), all set in the fictional city of Malgudi: Swami and Friends, The Bachelor of Arts, The Dark Room and The English Teacher. Of these four novels, only The Dark Room is still available in French. 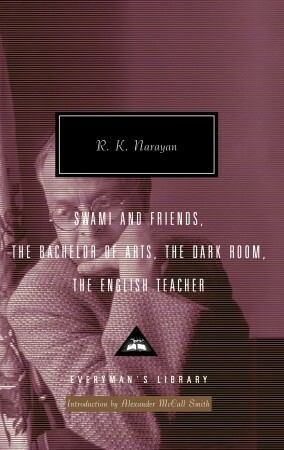 So far I’ve only read Swami and Friends but you’ll be sure to hear more about Narayan in the coming year. During summer Malguldi was one of the most detested towns in South India. Sometimes, the heat went above a hundred and ten in the shade, and between twelve and three any day in summer the dusty blanched roads were deserted. Even donkeys and dogs, the most vagrant of animals, preferred to move to the edge of the street, where catwalks and minor projections from buildings cast a spase strip of shade, when the fierce sun tilted towards the west. I don’t know you, but I can imagine the heat, the blinding sun that weighs on one’s shoulders and make you want to crawl into shade and not move until it relents. Details add up until you have a sense of the place. Swami and Friends relates moments of Swami’s life at the age of 10. (Swami is short for Swaminathan.) It’s not a story with a beginning, events and an ending. It is more composed of sketches about Swami’s life that give you a picture of the childhood of a middle-class Indian boy in the 1930s. Now he peered in and was disappointed to find the baby asleep. He cleared his throat aloud and coughed in the hope of waking him. But the baby slept. He waited for a moment, and tiptoed away, reminding himself that it was best to leave the other alone, as he had a knack of throwing the house in turmoil for the first half-hour whenever he awoke from sleep. Poor Swami doesn’t know how to interact with this baby and he’s still adapting to all the changes his little brother brought to the family’s routine. It reminded me of my daughter’s puzzled look when she first saw her younger brother. She didn’t seem to know what to think of this strange thing lying in his crib. Everything is described from Swami’s point of view so we see life through the lenses of a ten-year old boy. The narration is consistent with a child’s vision of time and life. He’s absorbed in school that gives rhythm to his life and his days are filed with children’s routine: school, homework, relationships with friends. He’s trying to be a good pupil but sometimes he gets bored. He’s afraid of some of his teachers but shows a great deal of character when confronted to adults. The opinion of his friends is as important as the opinion of his parents. When a new boy comes to town, Rajam, everyone wants to be part of his crowd. He’s an important boy, his father is the new chief of the local police. He’s more sophisticated, he’s richer, he’s got nicer toys. Swami’s full of admiration for him and Rajam becomes popular and gets his power after leading a little war against the former popular boys. Swami and his friend Mani befriend him after Rajam takes the power. Rajam will be the one to finance the creation of a cricket team. Swami plays well and is passionate about the game. It’s one of the most important things in their lives, something they’re ready to fight for, even if it means go and talk to a dreaded headmaster to secure regular practices. Swami and Friends is about school, friends, cricket, the birth of a younger brother and Swami’s relationship with his parents. It is set in India but Swami’s main concerns are the same as any middle-class pupil of his time and ours. Of course, there are cultural differences. He learns how to count with mangoes when a European boy would have heard about pears and apples. And he plays cricket, a game almost nobody plays in France. (I’ve seen a team in a neighbouring town: all the players were of Indian or Pakistani origin). And for him Europe is as imaginary as Neverland. He sat at his table and took out his atlas. He opened the political map of Europe and sat gazing at it. It puzzled him how people managed to live in such a crooked country as Europe. He wondered what the shape of the people might be who lived in places where the outline narrowed as in a cape, and how they managed to escape being strangled by the contour of their land. I thought it was quite funny. But apart from local differences, it felt universal. The fact that this is colonised India also seeps through the novel. For example, at the beginning of the book, Swami goes to Albert Mission School until his father decides to change him of school and make him attend the Board High School. The change came after a teacher denigrated the Hindu religion in class only to praise Christianism. And there is a protest march in Malgudi because a political militant was arrested in Bombay. I read Swami and Friends at the same time I was reading My Ántonia by Willa Cather. Both relate childhood memories but I preferred Narayan’s tone. As it is Swami’s point of view, the reader can’t expect a deep insight on what’s happening around him. It is different when it’s an adult telling his story like in Cather’s novel. Narayan’s book has the warmth of Naguib Mahfouz’s novels. The two writers were contemporary. Small people come to life under their pen and the characters and places become familiar and loveable. PS: Swami and Friends is out of print in French but I picked the French cover anyway because it’s a collection for young readers and I’ve discovered many great books in Livre de Poche Jeunesse. These covers belong to my childhood memories. I’m so glad you’re enjoying Narayan – Swami and Friends is perhaps his best book, although The Guide comes close (you should read that one as well). One thing, I think, that needs to be kept in mind is that Narayan is not depicting the life of a typical *Indian* middle-class family — perhaps it would be more accurate to say *South Indian* family, or even Tamil family, because the cultural differences across the country are so vast, and lifestyles vary so greatly. For instance, as a North Indian teenager reading Swami and Friends, I felt that I was an outsider looking in – maybe almost as much as you did. Cricket is, of course, the great glue that binds the country, but apart from that, there are a whole bunch of eccentricities and idiosyncrasies that you would not find in the North (which, of course, has its own set). And, you must read The Guide! Thanks for your comment. You’re right, I should have said Tamil family. I don’t know much about India but I should have guessed that Swani’s culture cannot be representative of the whole country. It’s incredible that it should feel as strange to you as to me. Who would be the Narayan of the North of India? Ruskin Bond is perhaps the closest, in terms of this genre of writing. See, for instance, “The Adventures of Rusty”, or his short story collections. The legendary – and canonical – Hindi (which is the language of much of North India, subject to different dialects) writer is Munshi Premchand, who was active in around the first half of the 20th century, but I’m not sure if you’ll be able to find his work in translation. Munshi Premchand is available in translation. Which one do you recommend? Godaan (The Donation of the Cow) is the immortal classic. “Gaban” (not sure of the English translation) is another very important work. I have read The English Teacher and remember enjoying it, but being before my blogging days, harder to recall than if I’d then had to pen those thoughts! If it’s come from Vishy, it’s sure to be a gem! And yes, any recommendation by Vishy is probably a good one. I don’t think I’ve come across this author before, but it sounds as if this novel conveys a real sense of place. It’s interesting you mention the warmth in the writing as I can sense it from your review. Even the title ‘Swami and Friends’ gives a feel for the tone. If you’ve read Naguib Mahfouz, then you have an idea of the kind of warmth I’m talking about. It’s this amused look on his characters and the fondness for his people. You have that also in True Believers by Joseph O’Connor. You know I’m not big on books narrated by children or seen through children’s eyes so I’ll pass on this one. I’d seen the book before and picked it up a few tears ago in a bookshop. Let’s see how good The Bachelor of Arts is. Perhaps you’ll be tempted to try him then. Wonderful review, Emma! So glad to know that you liked ‘Swami and Friends’. Narayan’s description of the South Indian way of life stood true, I think, even till the 1980s, though this book was written in the 1930s. I enjoyed reading that passage about how Swami feels about his new baby brother (and how your own daughter reacted to her new baby brother). I loved that passage on Europe too – it made me smile 🙂 It was interesting to read your comparison of ‘Swami and Friends’ with ‘My Antonia’. I haven’t read that (I have to read your review), but I hope to read that sometime. 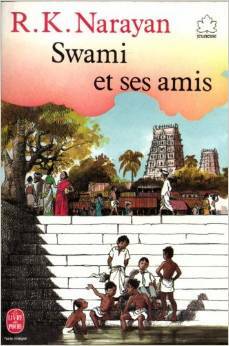 The French cover of ‘Swami and Friends’ is nice. And I agree with GautamBhatia – Ruskin Bond wrote beautiful books for children and teenagers and he is quite popular. I wouldn’t really call him a North Indian writer though – he was British by birth, but he has lived in India for most of his life. And most of his stories are set in hill stations which were frequented by the British administrators of colonial India. Premchand is regarded as the founder of modern Hindi and Urdu literature. All his novels are classics. I hope you enjoy ‘The Bachelor of Arts’. (that word is a pun – one interpretation is that it stands for the B.A. (bachelor’s) degree that one pursues in university. The other indicates that the main character is a bachelor and single.) Happy reading! Thanks for the explanations, Vishy, it’s very useful. I got the pun about the art of being a bachelor but I don’t know what a B.A. degree is. That’s what I need to research. Lucky you to have met him. I’ve been to your blog and read the story of your meeting with him. I would have been in the same state as you if I had had the chance to meet my favourite writer, Romain Gary. I think I’ll enjoy Malgudi a lot. Wow, you were persistant. I’m glad you manage to see him and take that picture. I’m usually not a huge fan of children narrators or storied told from the perspective of a child but it worked here. Only great writers can write well from the perspective of a child, unless they have a gift for children literature. There’s a passage about religion but it’s real quick. I don’t know why this theologian recommended Narayan. I’m still waiting for the right time to read this book and the other novels. I know I will like it but sometimes you just need the a special moment. I would have thought you’d like a narrator looking back better but then again it does sound as if Narayan’s narrator is much more endearing. I liked his voice. I like when writers describe the life of ordinary people and bring neighbourhoods to life. I’ve read Narayan’s The Painter of Signs, which I rather liked and has a similarly gentle tone. That’s about a young man who falls in love with a young woman involved in the planned parenting movement, so it has politics but lightly worn (though that doesn’t stop Narayan making some points about both the personal and the political). He’s a talented writer. Nice to read more about him. I’m interested in The Painter of Signs. I’m curious about the plot. Thanks for the pointer. If you liked The Painter of Signs, you’ll probably enjoy The Guide very much. OK, it looks like my first comment decided to disappear. Hope this won’t be a duplicate. I was finally able to find your blog (after I changed computers, I lost almost all my links when I exported them). Narayan is one my favorite authors, and this is the first book I read by him. I read it in French. My favorite is The Painter of Signs though. I bought the 2 Everyman’s Library books, and I don’t understand why they did not include this novel. I’ll try to catch up on all the articles I missed from your blog. The English Teacher is in one of my Everyman’s Library set, but I haven’t read it yet. The Man Eater of Malgudi, I will have to borrow from the library. Thanks for more suggestions. Welcome back, I love comments on older posts. I hope the computer problems are solved, it’s always a nightmare when that happens. You’ve read Swami and Friends in French, have you read it in the Castor Poche edition? The Painter of Signs ounds interesting. I’m glad you could pick new reading ideas! that’s the purpose of that blog. I read Swami et ses amis back in 1989, so I don’t remember the edition.